Are you saddling up to celebrate the Kentucky Derby tomorrow? 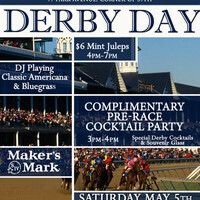 Make your way above 14th street to Park Avenue Tavern, where they will be hosting a special Derby Day Cocktail Party for fans betting on the next ‘Animal Kingdom’. If you can’t be in Louisville, why not party hard in New York City? Rock your biggest hats, brightest dresses or formal button downs (dress to the likes of Millionaire’s Row and you could win a $50 gift certificate!) and enjoy specials all afternoon at Park Avenue Tavern! Start with a complimentary one-hour Pre-Race Cocktail Party sponsored by Maker's Mark from 3pm to 4pm. Sip $5 Mint Juleps from 4pm to 7pm. There will be special Kentucky Derby themed cocktails and a souvenir glass, for a fun, kitschy way to get tipsy. The DJ will spin classic Americana and Bluegrass, to get you in the southern spirit, while a live telecast of all race day activities will play around the bar. Park Avenue Tavern. 99 Park Avenue. Are You Dating Your Dad? Are His Eating Habits Sabotaging Your Diet?